This fabulous, well-maintained, riverfront two-story all brick home sits on a high bluff and has never flooded from a storm or hurricane. 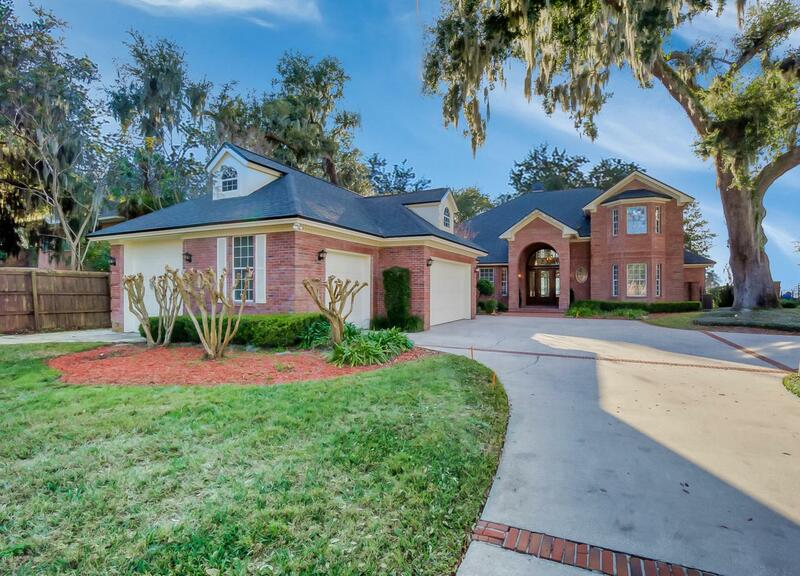 The home is located in the prestigious San Marco/San Jose area of Jacksonville and has 97 foot frontage on the St. Johns River.This private 3/4 acre cul-de-sac lot, has gorgeous river views from almost every room. It's such a stunning home that has a gated front entry with majestic live oaks and spectacular sunset views. Large backyard includes pool with heated Jacuzzi, upper and lower patios with pavers and lighted walkway to the river.The house was completely remodeled in 2014. Updates at that time included new architectural shingle roof, kitchen with granite countertops & new SS appliances, newly painted throughout, bulkhead and dock, resurfaced pool, and landscaping. New owners added induction cooktop, had brick water sealed, new dock pilings installed up to the platform, dock was upgraded using new composite material called Thru Flow in December 2017. Two AC units 2016. Commercial grade security cameras, bulkhead was re-enforced.The house has extensive custom woodwork and crown moulding, cove lighting, built in bookcases, mahogany 8' custom leaded glass entry doors with a 5' glass transom which all adds to the homes' beauty.